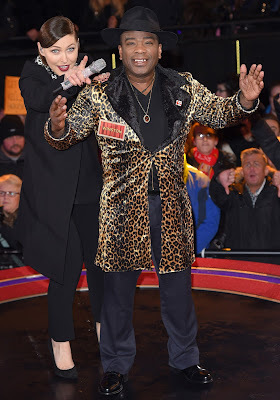 WINSTON McKenzie has sparked a homophobia row BEFORE even stepping in to the Celebrity Big Brother house. The former UKIP MP* - who is now a member of the English Democrats - made a bizarre comment about co-habiting with gay people in his VT that aired ahead of him entering the famous house. He chuckled: "I'd cope with a homosexual in the house, I guess I just have to be standing against a brick wall all the time." This is impressive - as the comment was made in a pre-recorded segment the producers presumably included it to introduce him to viewers as the series' homophobic pantomime villain. And yes, if he'd said it in the house, there'd have been a 'dramatic showdown' and he'd probably have been ejected. There are two gay men in the house so far to offend, ex-Eastender, John Partridge, and X Factor's Christopher Maloney. Noted heterosexual, David Gest, is also in there, alongside the bisexual, Angie Bowie. Anyway, great to see ver gay media go into predictable meltdown. Here's the Mirror's handy guide to 'the controversial politician'. * You've probably noticed he wasn't a Ukip MP, he has stood for several political offices for several parties and always failed spectacularly.